Dr. Richa Chaturvedi is a Sr. Endocrinologist and Research Investigator at Apollo Clinics (Sector 14). 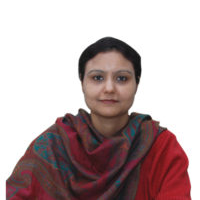 She is an orator and has been felicitated in various conferences. She is also known for her publications in various medical journals including NEJM. MBBS, Institute of Medical Sciences, Banaras Hindu University (IMS-BHU). MD (General Medicine), Institute of Medical Sciences, Banaras Hindu University (IMS-BHU). DM (Endocrinology), Lala Lajpat Rai Memorial Medical College, Meerut. Speaker & faculty at various forum. I have diabetes for the past 6 years. I have been treated by Dr. Richa Chaturvedhi. Since the beginning of the treatment, my diabetes and sugar levels are under control. I would like to specially thank the dietician and the rest of the support staff for the guidance and advice they have given me these 6 years. They have been constantly reminding me on continuous monitoring of blood sugar levels, treatment regimen, and follow-up consultation. My overall experience at Apollo Sugar Clinics has been very great and I would certainly recommend Apollo Sugar for my friends, relatives, and colleagues. Thank you Apollo Sugar.